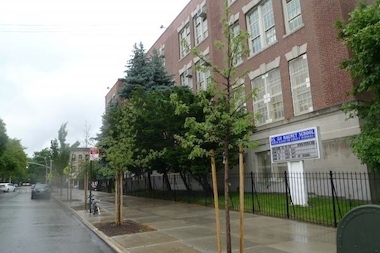 A DOE plan to rezone P.S. 130, P.S. 230, P.S. 231 and P.S. 154, shown here, is drawing criticism from parents. WINDSOR TERRACE — A plan to rezone four schools in Brooklyn's District 15 is drawing criticism from parents who say children will be forced to travel too far and cross dangerous streets. The proposed rezoning would expand the zones for P.S. 130 and P.S. 230 and shrink those for P.S. 131 and 154. The plan would also split P.S. 130 into two sites, with lower grades in the school's existing building and grades three through five in the new P.S./I.S. 437 building at Caton Avenue and East Seventh Street. Parents say the proposed boundaries would force some kids who now live in the P.S. 154 zone to trek more than half a mile to the new P.S./I.S. 437 building — including across "dangerous intersections." "I just don't think it's the right thing for the neighborhood," said Meryl Weissman, one of nearly 100 parents who've signed a petition opposing the rezoning plan, which the DOE unveiled on Oct. 8. Parents are worried that kids would have to cross McDonald Avenue — where safety has long been an issue for locals — then wait for an MTA bus to get to the new P.S./I.S. 437 building, Weissman said. Some students will also have to navigate the busy intersection of Ocean and Caton avenues, she added. The petition calls on the DOE to provide busing for some children and asks the DOE and the city's Department of Transportation to come up with pedestrian safety strategies for the affected schools. The DOE did not immediately respond to a request for comment. "Having [our son] traverse two highways now to get to P.S. 130 is very concerning,” wrote a P.S. 154 parent who signed the petition. “We also feel like this rezoning came out of nowhere with little warning and little opportunity for our input." While officials have said that the rezoning proposal was crafted after extensive conversations with families, critics say there was little publicity about the changes. Parents are asking the District 15 Community Education Council to hold another public forum before the CEC votes on the rezoning plan on Nov. 12. The DOE's Panel for Educational Policy must approve the plan to split P.S. 130 into two buildings. That vote is scheduled for Nov. 25. District 15 CEC president Naila Rosario declined to comment on the petition.